OUT OF MILLIONS OF AMERICAN EXECUTIVES, ANDI BOWE WAS CHOSEN TO BE IN THE TOP 1%! Congratulations! 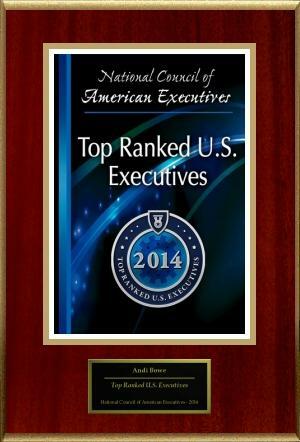 You’ve been recognized as a Top Ranked U.S. Executive. Millions of executives provide information online about their careers each year. The National Council of American Executives in partnership with The American Registry, has analyzed thousands of entries to identify those within a certain area and location who are rated the highest. Of the millions of active executives, you are among the top 1% who have received this honor. We commend you for this achievement. In an effort to aid your customers and clients in their search for top-quality service, we’ve set you apart from your competition by adding you to The Registry™. We invite you to view your award online. You can learn more about this recognition by visiting our website. Again, congratulations on this distinctive achievement!